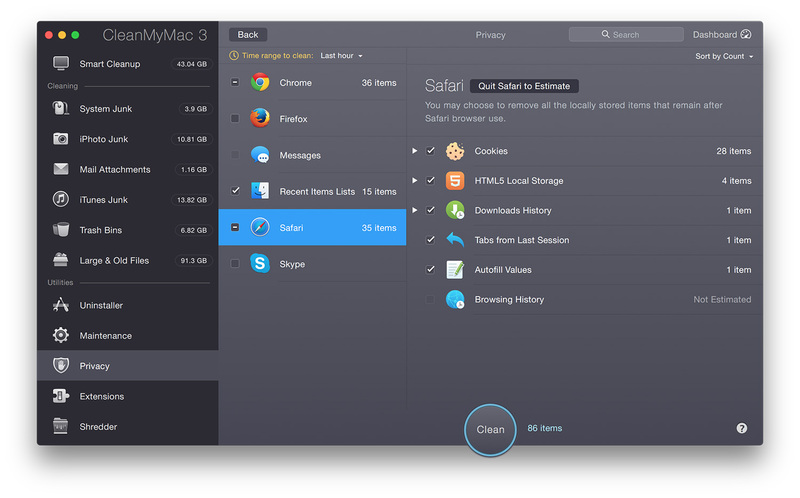 MacPaw, the software company behind CleanMyMac, Gemini, and Hider 2, has today released CleanMyMac 3. This latest release of the Mac disk space ‘cleaner’ comes with a refreshed user interface that fits much better with the new design of OS X Yosemite, but it also includes new features that allow it to detect more unnecessary or redundant data, as well as some new maintenance and privacy features. Perhaps the most interesting new feature to me in CleanMyMac 3 is the ability for it to detect and remove email attachments from Mail.app and broken downloads, old iOS updates, and app downloads from iTunes. When I ran it on my MacBook, I was able to remove over 3GBs of Mail attachments, many of which were from years ago, and because I keep a copy of my emails on the mail server, I can always re-download the attachments if I need them again. Likewise with iTunes, I removed all the downloaded iOS apps because I no longer sync my devices with iTunes and was able to free up another few hundred MBs. 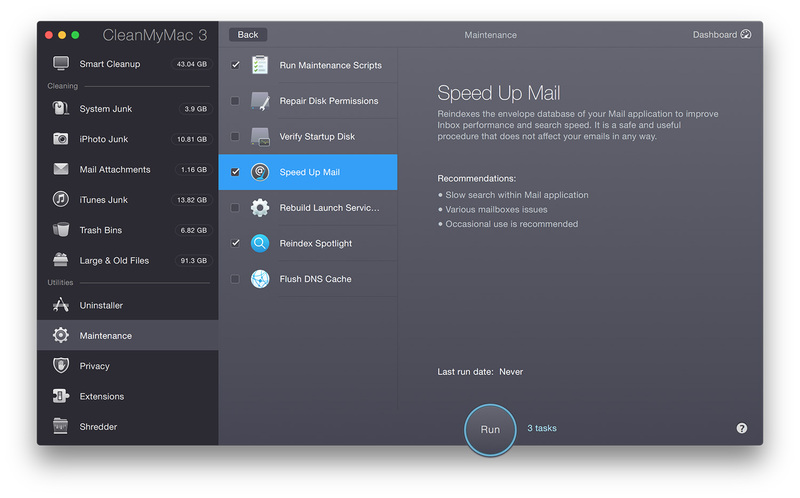 New to CleanMyMac 3, there are also a collection of maintenance tasks you can run. Most of these are tasks that can be accomplished by OS X without CleanMyMac (such as repairing disk permissions), but I can see it being handy to have them all in one place. Personally, I don’t plan on using these very often, if at all, because frankly I don’t believe it to be necessary to do these kinds of maintenance tasks. But at the same time, I once had to reindex Spotlight which helped fix an odd bug I was having, so if something is being a bit weird on your system, this may be useful. Arguably more useful are the new privacy features which let you clean up chat logs (from Messages and Skype) as well as browser data (cookies, download histoy, autofill, etc.) and even recent items lists from Finder. As with everything in CleanMyMac, you are given complete control over what you delete – it is not an everything or nothing situation. 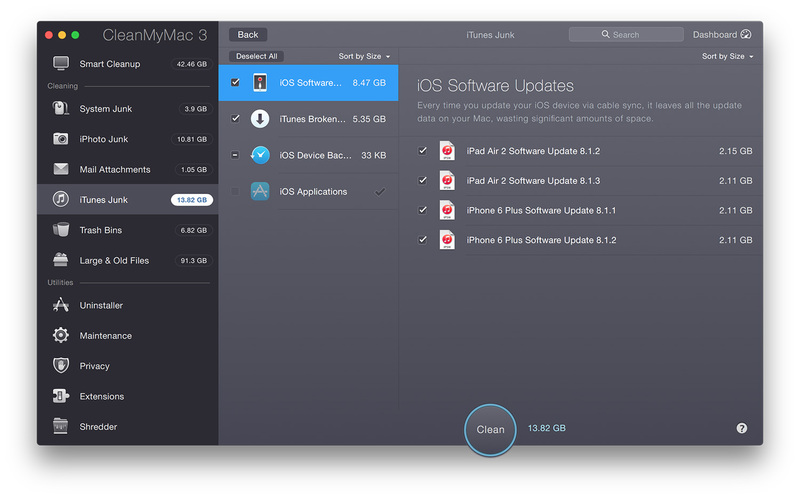 All in all, CleanMyMac 3 is a solid upgrade that brings improvements and completely new features. It certainly isn’t a necessity to use this app, but as someone with an SSD laptop as my primary computer, storage space is always limited and I’ve been using CleanMyMac for a few years to get a little extra space. CleanMyMac 3 is available for $39.95 (for 1 Mac). Existing CleanMyMac 2 or CleanMyMac Classic customers can purchase an ugrade licence for 50% off.